A shot can be a bullet or a photo. I had my shoulder camera with me at meet-up recently with BPD Chief Michael K. Meehan and dropped the word — shoot. DOESN’T MY FRIENDSHIP WITH CHIEF MEEHAN PROTECT ME FROM OTHER COPS? As I tell my friends, I could have had the chief of the FBI with me and I would still be subject to police commands. I have no illusions of being not subject to arrest, even though — especially though, I’m a press photographer and often in the way. The shot that almost got me busted, Thursday. Photo by Ted Friedman. Shooting the final week of Berkeley’s 14-Week Telegraph Sundays’ street fair, I aimed high but wound up low when I published a shot of a U.C. 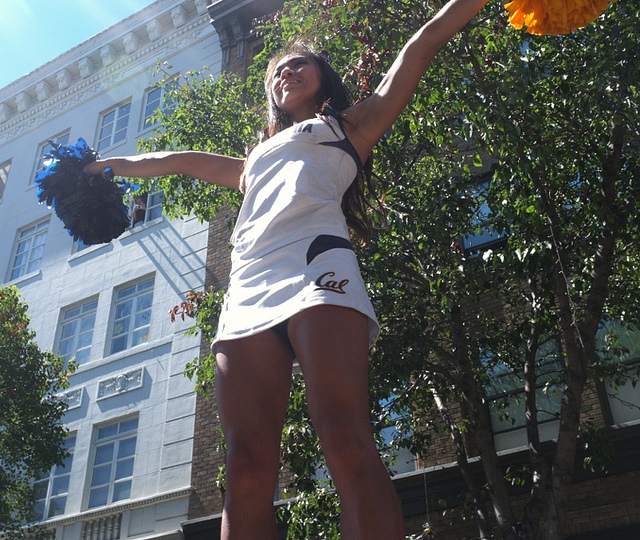 Berkeley cheerleader, hoisted high above me. I shot from ground level as the acrobatic cheerleader hit the top of her stack. Clarence Thomas’ senate-confirmation hearings, two decades ago, was far from my mind. Thomas was, then, accused of seeing pubic hairs on a coke can but was confirmed to a seat on the supreme court bench, where he might imagine to his heart’s content. He has hardly been heard from since, since being swallowed by his own robe. Low-down. Photo by Ted Friedman. “We have a reputation for being, like completely drunk and ridiculous,” an Irish summer student told Daily Cal recently. Fraternities won’t rent to them, admitted an Irish summer student, but some new partners in a South Side building’s ownership decided the revenue from otherwise vacant units was worth any risks. They had been warned by the building manager. According to the manager, one such unit has been “trashed” beyond the security deposit’s ability to recover. 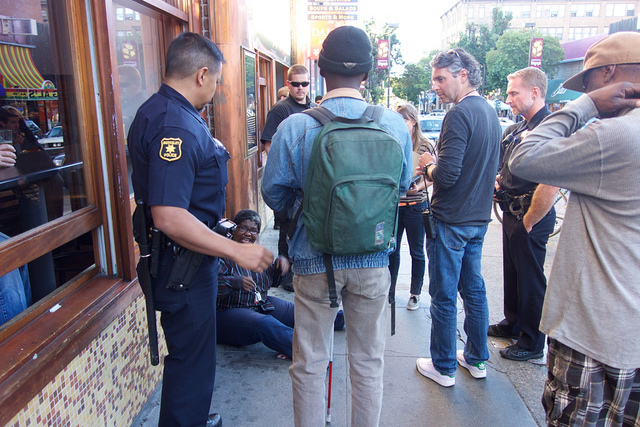 There have been a string of complaints (even from across the street) to Berkeley Police. Building security has been breached. One hapless resident was willing to put up with late night/early morning noise, which echoed through its courtyard and the drunken party or two, but that was before the piss fall. Articles on the workings of media are often crowded out by hard news. It’s hard enough to regularly read anything — unless it bleeds. Read this as trivia or hearsay — my kind of say. Berkeley Reporter will have more time to dish now that he spends most of his time photographing for a local publication, and developing his series, South Side Tales — a casserole dish — for Berkeley Times. My career as a reporter, such as it was, is in shambles now that the Berkeley Daily Planet [ted friedman] has admitted it is “no longer a newspaper.” The Planet recently cancelled deadlines, the mainstay of “when” in who, what, where, when — the pied piper of journalism. My photo-journalism continues, but not my reportage. Deadlines were already slack at Berkeley Daily Planet (I had a two day lead-time with all but the fast-breaking story), as my Planet editor and I conspired to flout rules we considered foolish while observing rules we admired. Only this week, something I put a great deal of reporting into ran on the Planet as “Public Comment.” It was the definitive background piece on Berkeley’s post-office protest. I was lucky to get it published there, especially with the paragraph revealing my cynicism and other lapses. I’ll figure out how to contribute to the new Planet; maybe public comments. Berkeley Reporter contributes short, but regular, news-like squibs on Berkeley, Ca. Patch, a community bulletin board along with cat and dog announcements. A drunk did drop his pants outside Peet’s on the eve of Cal move-in weekend with Cal parents on-scene. Parents did nuzzle with their kids. “We know he’s leaving our nest,” said a Cal alum, scarfing a Top Dog (a Berkeley tradition). 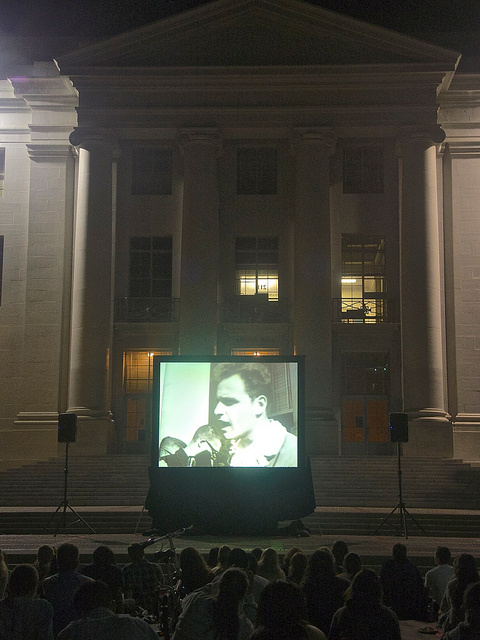 Berkeley’s Save Our Post-Office is about to perish, and, yes, Mario Savio of 60s Free Speech fame did do a cameo from the steps of Sproul Plaza where his spirit (and plaque) immortalize him. Berkeley Reporter was there—ike CBS media giants Charles Daly, Don Hollenbeck, and Richard C. Hottelet. Why is Berkeley so good to me? Because I am a born-again drop-out? Savio (d.'96) Speaks at Sproul, 50 years later. Photo by Ted Friedman.